Finally the day of we will touch the sci-fi movies technology is coming, today LG announce the start mass production of the world first Plastic E-Paper Display, its the first flexible display for public using liquid crystal display technology using an electronic paper display (EPD) with size 6" XGA (1024 x 768) resolution with a thickness of 0.7 mm, LG promise with this innovation a new era for the E-Book with a lighter, thinner and flexible products, the new product will be ready and supplied to ODM companies in China, then, it will be released in Europe at the beginning of next month, bellow a press release from LG with more details. 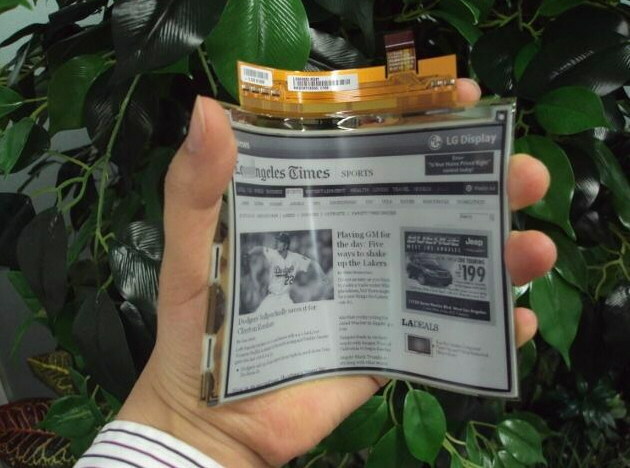 The world's first plastic EPD from LG Display offers users a paper-like reading experience with a plastic substrate that is as slim as cell phone protection film, and a flexible design that allows bending at a range of 40 degrees from the center of the screen. Compared to glass EPD of the same size and resolution, LG Display's plastic EPD realizes a super slim thickness of 0.7 mm which is 1/3 slimmer than existing glass EPD; as well as a weight of 14g which is more than 1/2 lighter.